RETROactive has had another successful year and thanks goes to YOU, our amazing readers, for your support. We couldn’t have done it without you! RETROactive will be taking a break over the holidays — we will resume publishing on January 3rd, 2018. We look forward to seeing you all in the New Year! Season’s Greetings! With its hustle and bustle, Christmas Day will soon be here. Before we celebrate the magic of the holiday season, let us look back at the wonder and charm of a simpler time. The extensive photo collections at the Provincial Archives of Alberta and the City of Edmonton Archives offer a unique glimpse into the celebrations of Christmases past in Alberta; the following images were selected from their holdings to create a photo montage dedicated to old-fashioned holiday memories and traditions. Enjoy! Got Christmas tree, Mountain Park, Alberta [ca. 1943-1944], (Provincial Archives of Alberta, CL120). 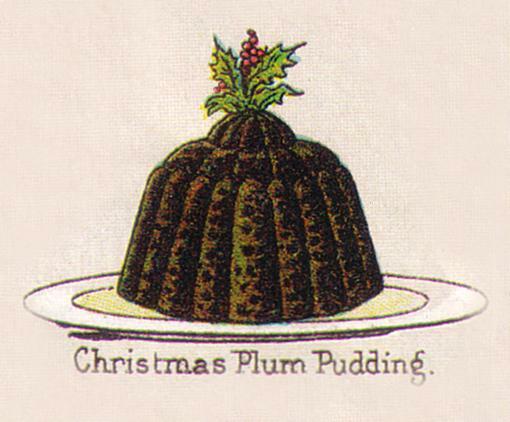 PLUM PUDDING – A VICTORIAN CHRISTMAS MUST! Not only does the holiday season include fun outdoor activities, festive bright lights and the sweet sounds of Christmas melodies, but it is always filled with an assortment of tasty old-fashioned baked treats. Thanks to our colleagues at Rutherford House Provincial Historic Site, we are pleased to share one of Mrs. Rutherford’s classic Christmas desserts, a treasured family recipe for plum pudding passed down from her mother. Chop fine 2# suet, add #2 seeded raisins cut in half, #2 seedless raisins, ½# peel, ½ # almonds cut in half or slices 4 cups bread crumbs. Beat 8 eggs, 2 cups milk and 2 cups brown sugar together. Add sifted 2 cups of flour, ½ tsp cinnamon, ½ tsp nutmeg, 2tsp salt, 4 tsp baking soda. Combine with fruit. Fill oiled moulds 2/3 full. Steam 3 – 4 hours. Cream butter and sugar, beat egg lightly add with lemon juice and nutmeg, beat until light and fluffy. Add water 1 teaspoon at a time and beat well heated over hot water (double boiler?). Serve hot on pudding. Should any of our readers decide to take it upon themselves to try and make Grandmother Birkett’s Plum Pudding recipe, please let us know how it turns out. Comments are always appreciated; we anxiously await your review! This post was originally published on RETROactive on December 11, 2014. We are back into ski season, so please enjoy this post that highlights the history of ski jumping in Alberta! The huge metal ski jump at the Stoney Creek Valley in Camrose is an impressive sight. It is the legacy of the daring Norwegian flyers who made Camrose the birth place of ski jumping in Alberta. Adolph and Lars Marland, P. Mikkelson and the Engbretonson brothers formed the Fram Ski Club there in 1911. It was named for the Fram, meaning “forward” in Norwegian, the ship that carried Roald Amundsen on his famous expedition to Antarctica. The Fram Ski club began construction in the fall of 1911 on a fifty-foot scaffold tower with a long slide in the Stoney Creek valley. 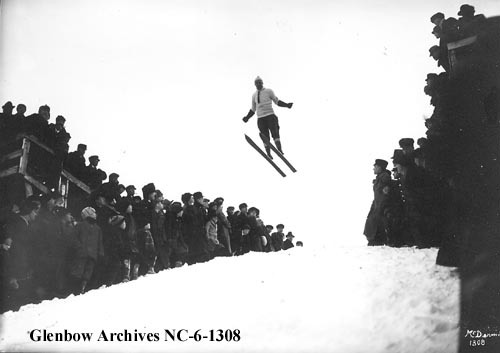 Anticipation mounted for the club’s first ski jump tournament held in January 1912. People came from miles around in sleighs and cutters and happily paid the 25 cents entry fee. Adolph Marland soared seventy-four feet through the air to be acclaimed the winner. Ski tournament, Edmonton, Alberta, 1914 (Glenbow Archives, NC-6-1308).